As of December 28th, FRED shows 39 Pre-Registrants, 13 of whom are As! I'll go with the same prediction... Carpenter. I guess I voted for age and treachery. Get 'em Dark Knight! Some breaking insider info here.... Joe Socolof and Miles Phillips are coming to the Rose too... in case any of you youngsters don't know these guys, they were teammates of mine at the NYAC in the late '80's early '90's.... Joe made at least 2 WC teams, Miles made at least 1 WC and was 1st alternate on the 92 Olympic team. Lock up the women and children!!!!!! Katy bar the door!!!!!! This is gonna be one hell of a brawl!!!!!!!!!! 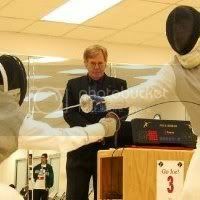 Why couldn't this exodus of NYAC As include any sabre fencers? That said: who was foolish enough to give me the other vote? Well, we certainly have enough golf courses in Houston and the Gulf Coast SSCC is just over a month out. Pleanty of warning time. Come to think of it, there's one not that far from the venue. I'm sure I can find bourbon, what's his favorite flavor of poison? As to jazz, we got some of the New Orleans diaspora as well as a good local milieu, to say nothing of some truly fine blues... What sort of jazz does he favor? Oops... good point kd5... I should get him to come down for my own tournament.... sorry schalger....ya'll make the drive up to Dallas though, won't you? and put there by a participant from this thread. Share the fun, by all means. BTW, that kid of Paul's born yet? I don't know, and I don't intend to risk my health by asking anytime soon. I don't think Natasha's come along yet, but probably any day (week?) now. Maybe Terry can seed by "All National Point ever held"
Unfortunally the USFA online archives just reach back to 1996. Yea, its going to make the seeding quite interesting for that event! ...Jim Carpenter took gold, with silver to Jens Stephan, and tie for bronze to Brent Kelly and Michael Aufrichtig. Wow, and check this out, A&M fencer Miles Phillips, going in as a D04, placed 6th out of 44. He is the only person in the top 12 who didn't go in as an A!!!! Miles was a landmine - he used to be one of the best fencers in the country in the early 90s. His stuff was all spare parts from different people (mostly from Jim). Result: missmatched Uniform that didnt really fit, no name on the back - brown shoes. Gave him kind of the look "I am an adult beginner and am very happy to be here". Carlos Bruno was afterwards like "who is this guy". Heh. From near Olympian to D. And now on a comeback. Also, it appears at the time I posted Natasha was ~12 hours old. Does anyone know where I can find the latest newly licensed openings with this law office? I have already tried Latest Law Jobs nevertheless their job advertisements do not reveal the name of the law firm. There are lots of newly qualified associate roles out there still, the problem is that most of these roles are over recruitment agencies that do not show the law firm names. Any advice would be much appreciated.